Natural Blue Larimar Gemstone Stretch Translucent Beads Bracelet AAAAA. 1pc exactly the one the pictures show. Larimar came to be through the movement of hydrothermal fluid (super-heated steam rich in minerals) that was forced under high pressure from deep within the earth to the surface. As the steam travelled up through cracks, fissures, volcanic chimneys and lava tubes, it cooled and crystallized to form Larimar. Though pectolite can be found throughout the world, it is only in the. Where the presence of cobalt causes the distinct blue colour. Essentially Larimar is a healing stone that promotes harmony and balance between ones materialistic and spiritual realities. It does this by helping us to see ourselves from beyond our personal and limited perception of reality and to be our true selves in the material world. Integrity, objectivity and truthfulness are hallmark characteristics of the energy of Larimar. It helps us to see the bigger picture and put things into perspective. It helps us to look at out own selves objectively, which in turn makes us aware of our self-imposed limitations and allows us to work to be free of those limitations. Larimar is said to embody the elements of both air and water, symbolic of thought and emotion respectively. Consequently it plays a role in achieving balance between one. S emotional and mental states. It stimulates all of the chakras from the heart to the crown. Larimar is also attributed with attracting soul-mates to the user and customers to the salesperson. It cultivates a sense of calm and peace and may be beneficial for those who are under stress. It is said that Larimar has healing applications for ailments of the cartilage, hair and feet. Reflexologists may find it useful as it opens acupressure points in the feet. Spiritual healers have used it to purge entities. The benefit of self-realization that Larimar brings to the individual may be a precursor to something greater, as Larimar is considered an Earth healer. With the self-realization of individuals comes the self-realization of the planet. Simply request a combined invoice when you are finished shopping. Our Pictures are enlarged to show the items details. Pls check our item details description for actual size. And Color may vary slightly due to the color calibration of each individual monitor. If you have not checked out your items after 14 days, we have the option to relist the item unless you let us know that you are still shopping. We take pride in our packaging. We are committed to 100% satisfaction and will work to resolve any issues you have regarding our items. 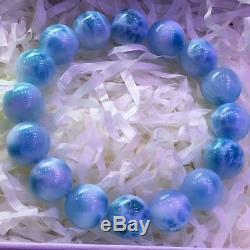 The item "Natural Blue Larimar Rare Gemstone Translucent Beads Bracelet 13mm AAAAA" is in sale since Saturday, December 1, 2018. This item is in the category "Jewelry & Watches\Fashion Jewelry\Bracelets". The seller is "reikocrystalbeads" and is located in Fujian. This item can be shipped worldwide.